Early in 1911 citizens of Doniphan Township pledged $1,000 toward construction of a new bridge over the Platte River. The proposed structure would replace the existing timber bridge that linked the area with Grand Island. In response, the county supervisors authorized the Nine Bridges Road north of Doniphan to serve the proposed crossing. The county waited a year and a half before acting on the bridge itself, however. After soliciting advice from the Union Pacific Railroad, which spanned the Platte at many locations, the supervisors decided to constrict the river's channel width by some 340 feet and erect a three-span pony truss. Finally, on Christmas Eve, 1912, they ordered the new structure from the Standard Bridge Company. Construction progressed quickly. Using steel components rolled by Jones and Laughlin, Standard completed the trusses by the end of May 1913. 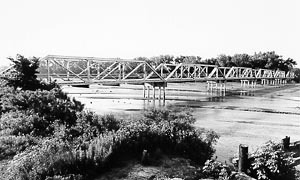 The Nine Bridges Bridge carried mainline traffic until construction of a parallel span over the Platte on U.S. Highway 281/34. Sold to the adjacent landowner in the mid-1960s, it is no longer open to traffic but is maintained in essentially unaltered condition. A subtype of the venerable Pratt truss, the Pratt half-hip configuration was marketed extensively by Midwestern bridge companies in the early 1900s. Its advantage was that, by eliminating the vertical members at the hip connections, it was more materially conservant than the standard Pratt. Its disadvantage was that it was generally limited to short-span applications: typically 30-60 feet. But Nebraska's myriad small streams lent themselves to this range, and, as a result, thousands of single-span half-hip pony trusses were erected across the state between 1900 and 1915. The half-hip truss was used less often for longer crossings, because its intrinsically short length necessitated more substructural work than did longer spans. 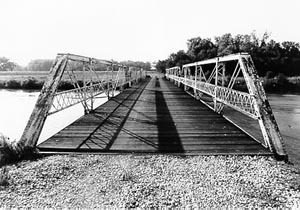 The Nine Bridges Bridge was therefore unusual when it was constructed across the Platte River, and it is even more uncommon today, due to attrition of virtually all other multiple-span examples of this truss type. It is historically significant as a regionally important crossing of a major watercourse and technologically significant as a noteworthy example of its structural type. On July 6, 1916, Merrick and Polk counties applied jointly to the Nebraska State Engineer for state aid funding on a bridge over the Platte River between the two counties. It was not until early 1924, however, that the Department of Public Works designed a ten-span pony truss for the Silver Creek crossing. On May 20 the construction contract was awarded to the Western Bridge and Construction Company. The Omaha-based contractor used steel rolled by Inland to complete the bridge the following year for a cost of $94,200. The Silver Creek Bridge carried traffic until its replacement in 1971. At that time the concrete deck was removed, and six of the spans were trucked to Hall County (the other four were scrapped). They were re-erected at this county road crossing of the Platte River south of Grand Island, where they presently carry light traffic. The longest-span pony truss developed by the state engineer was 100 feet; through trusses were typically used for longer spans. This length worked particularly well on the multiple-span state aid bridges built over Nebraska's wide, shallow rivers. Eight state aid bridges were constructed using multiple riveted pony trusses. Two of these, the Lisco and Lewellen State Aid Bridges in Garden County, remain in place in their original condition. The others have all been removed. The Platte River Bridge, although moved to its present location, is distinguished as one of the three multiple long-span riveted pony trusses left in Nebraska.